The seasonal Zara sale is my excuse to buy something that I normally wouldn’t because it is now on sale. My favorite out-of-the-box purchase were these yellow pants. Although they did not fit perfectly, I was willing to give them a chance. 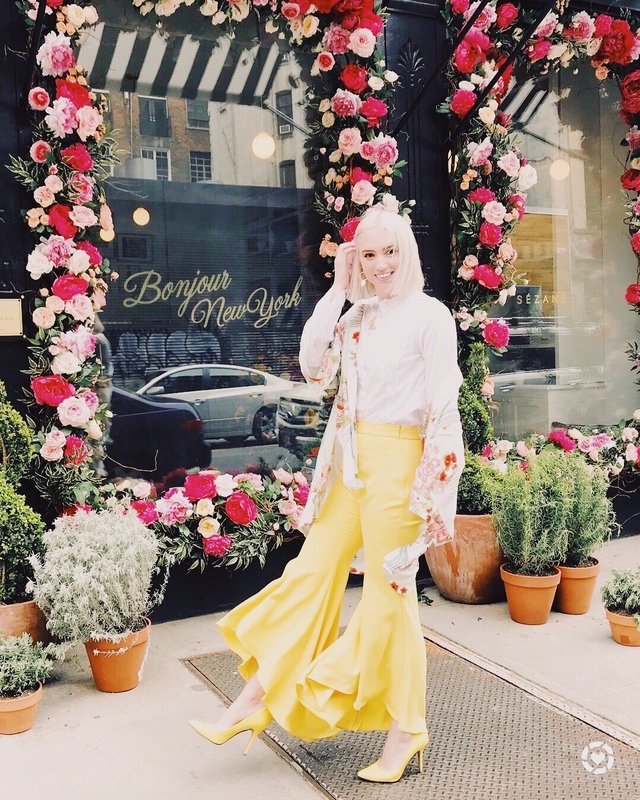 Sézane’s Soho floral display was a perfect backdrop for these pants in my mind. On Easter Sunday after church we scurried over to the floral door. We contemplated waiting for the store to open so that we could get a photo with the bike in the background as well, but did not want to surpass our brunch reservations. The slight gusts of wind going left and right perfectly complimented my pants, allowing them to flutter in the wind. I finished off the look with yellow pumps and a floral kimono robe.